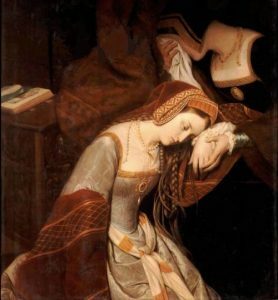 On the night of 17th May 1536, while the carpenters built her scaffold within the grounds of the Tower of London, Anne Boleyn prepared herself for her execution, which was scheduled for 9am on the 18th. At 2am, her almoner, John Skip (some say her confessor Father Thirwell), arrived to pray with her. She was still in prayer when Archbishop Cranmer arrived just after dawn to hear her final confession and to celebrate the Mass. 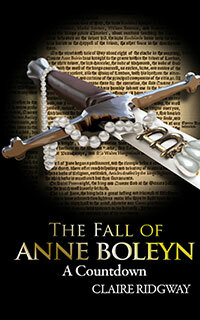 Anne Boleyn asked Sir William Kingston to be present while she took the sacrament. She swore on it twice, before and after receiving it, that she had not been unfaithful to the King, acts which Kingston reported back to the King. Anne then made arrangements for the customary distribution of alms using the £20 given to her by the King for this purpose, and then she waited for 9am, the moment she thought she would take her final walk. She went back to her prayers. When nothing happened at 9am, Anne sent for Kingston. She had heard that her execution had been postponed until noon. This was correct. Kingston had received orders to clear the Tower of foreigners that day in preparation for the execution the next day. He kept Anne in suspense a bit longer, but tried to comfort her by explaining that her execution would not be painful and that the blow was “so subtle”. To this, Anne replied with characteristic black humour, “I heard say the executioner was very good, and I have a little neck”, after which she put her hands around her throat and laughed heartily. She also joked with her ladies that the people would be able to give her the nickname “la Royne Anne Sans Tete” or Queen Anne Lackhead. Kingston was impressed with Anne Boleyn’s composure in those dark hours of waiting, commenting to Cromwell that “thys lady hasse mech joy and plesure in dethe”. Her faith must have sustained her. Anne was finally put out of her misery when noon passed and Kingston informed her that her execution had been postponed until the next day, the 19th. Anne was obviously distressed but all she could do was return to prayer and seek spiritual comfort. Elsewhere on 18th May 1536, it was reported to Cromwell by a Frenchman that the wax tapers set around Catherine of Aragon’s tomb in Peterborough Abbey “had been lighted of their own accord”. Spooky! What an awful time for Anne. I have shared this information on my facebook. I can’t imagine what she went through in those last days, just awful. Thanks for sharing, Lesley. Imagine preparing yourself for death and being told you had to wait. There is comfort in a time line – I get upset of a dental appointment is postpone. Anne, the more I learn about her – the more I admire her. Thank you for this! Thankyou so much Claire- what a treat! I have posted the link on my FACEBOOK Page. I hope you enjoy my second book, Sonia. RIP Anne. I am three quarters of the way through it-and hugely enjoying it immensely- you did an AMAZING JOB! How incredibly cruel. If the clearing of the people out of the tower was the reasoning behind the postponement why on earth was this not done the day before, it shows how utterly cold hearted the King had become, treating her like a cast off old piece of clothing. How she managed to hold it together I wll never know. Sad, isn’t it, that while Anne was awaiting the sword, Henry was out hunting with his ‘new friends’. As soon as the signal denoting the crime had been committed, off Hank went to the Seymour house. I can’t to this day beleave that Henry just stop loving her,Anne I think she new something was up,then henry walzes in and tells Anne you divoce me or you will be but to death,what a guy But this is the days for Anne,so i will say God Be with you, Rest In Peace our Beloved QUEEN ANNE BOLEYN. Baroness. I am three quarters of the way through it-and enjoying it immensely- you did an AMAZING JOB!